This review is going to be short and sweet, because this book is short and sweet. 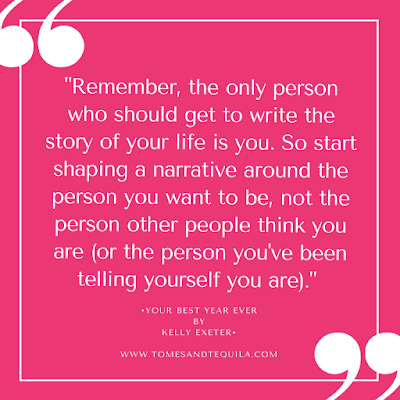 While I was writing my post about a few of my favorite Podcasts yesterday (you can read it here), I noticed that one of the ladies who makes the Straight & Curly Podcast, Kelly Exeter, has written a couple of books. I'm not sure if I really got across to y'all just how quickly I fell for this duo...but with a price of (at the time) $3.99 and $7.99 for the Kindle, I felt compelled to purchase both of her books. Well...it may also have had to do with the fact that she was nice to me on Twitter. Basically, if you send me a smiley face or a nice comment on social media, I will buy your book. What can I say, I'm a cheap date. 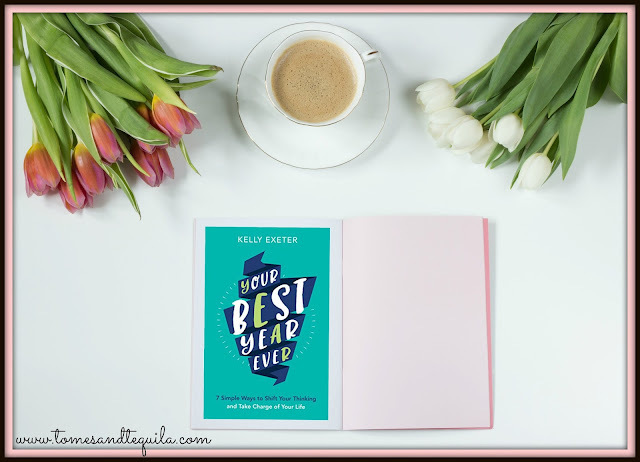 So last night I read the smaller of Exeter's two books, Your Best Year Ever (inexplicably titled Your Best Year Yet on Goodreads). I was able to read it, after working until 8 pm at the library, and then Skyping both my daughter at college and my husband on his "extended vacation to a foreign, sandy country" because it is a short and sweet 90 pages long (or 45 pages according to Goodreads?!?). I actually loved this little book. It helped me get to know a bit better one of the women behind a Podcast that I love so much, but more than that...it was filled with those little bits of knowledge that maybe you've heard before, but I always seem to need a good reminding about. As a self-help and self-improvement book junkie, there wasn't a ton in here that I haven't read in other places...there usually isn't. But, you can hear things a million times and all it takes is that one person to say it in a different context, or wrapped within a personal story that resonates, and all of a sudden it sticks. I felt like Exeter's delivery of her tips about Time Management, Habit Building, "Wobbly Courage" and more were so down to earth and grounded that they really sat well with me. I highlighted darn near the entire thing...and I was still thinking about it this morning. That doesn't happen all the time. Totally worth the $3.99, in my humble opinion...but then as I said...I am a self-help junkie. So, I'm giving it 5 Stars...and vowing to work harder on writing my own story of who I am, and who I want to be. And that's my attempt at Short and Sweet! LOL Hope you all have a fabulous Hump Day! !